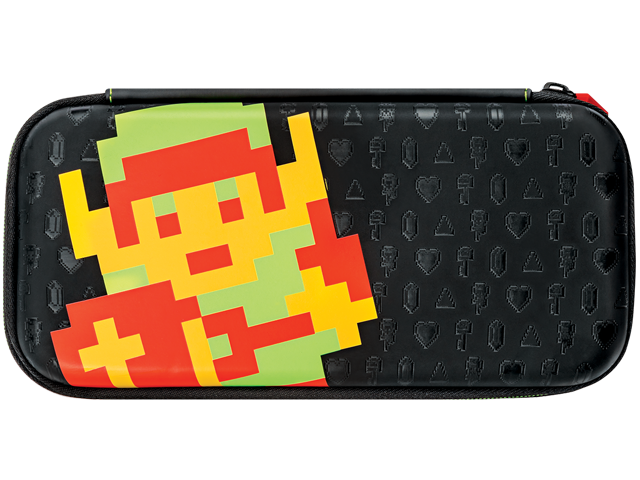 Enjoy some retro gaming goodness with the Switch Slim Travel Case - Zelda™ Retro Edition! Featuring cool 8-bit artwork and stylish debossed details, this case will show off your old school flair while playing on Nintendo's hottest console ever! Rigid EVA case plays sound effects when opened. Protective screen pad stores 6 games and features a mesh pouch to store various accessories such as earbuds, charge cable and cleaning cloth. Nylon lift strap for safe and easy removal of your console also attaches to pouch to hold your console securely inside the case.